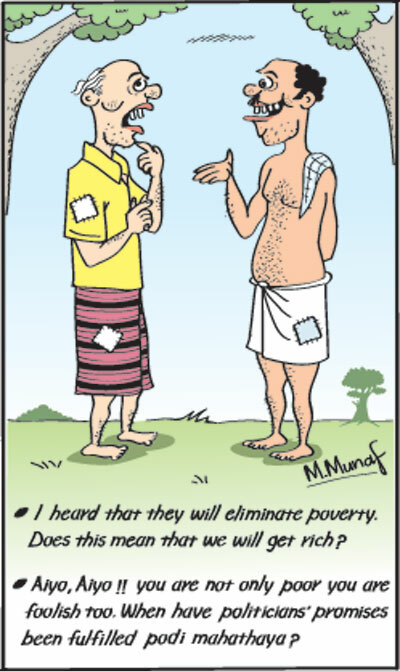 Oct 24 2016 - The elimination of poverty has been a popular promise among political leaders in Sri Lanka and elsewhere. Despite their repeated promises of eliminating poverty, poverty persists. The rhetoric on poverty elimination has far surpassed efforts to reduce it and not been adequately backed up by policies that mitigate poverty and reduce income inequality. The people left behind by economic growth have not been adequately taken care of by social security safety nets. The global experience provides useful insights on how poverty and inequality could be reduced. President Maithripala Sirisena has vowed to eliminate poverty in two years. President Premadasa moved a resolution at the SAARC Summit in Colombo in 1990 to banish poverty in South Asia. Yet South Asia remains the region that has the highest number of the poor. Although poverty has been reduced quite significantly in South Asia, a high proportion and number of people remain in poverty and income inequality has increased significantly in India and Sri Lanka. Reducing the incidence of poverty and reducing income inequality remain demanding challenges in both countries. Ending poverty and reducing inequality are two of the Sustainable Development Goals (SDGs) to be achieved by 2030. These may be the most difficult of the SDGs to achieve unless the rhetoric is supported by significant changes in economic strategies and social policies. The rhetoric of poverty elimination must be translated into effective economic and social policies. Economic policies that encompass growth with equity and social policies that improve the capabilities of the poor and redistributive income policies are vital to reduce poverty and income inequality. Even though poverty is still a significant feature of many economies the world over, income poverty has been reduced in many countries and several regions of the world in recent decades. Economic growth and economic and social policies have been responsible for this achievement. In contrast, the widespread experience of most developed and developing countries is that inequality has grown. Latin America that has one of the severest inequalities of incomes has been able to reduce income inequality recently. China’s poverty level of 84 per cent in 1981 was reduced drastically in 2010 to 18 per cent. India’s poverty of 60 per cent in 1981 was reduced to 33 per cent in 2010. Although a third of India’s population is in poverty, the decline has been impressive. Poverty continues to decline and is perhaps around one fourth of her population now. In both countries rapid economic growth has been the most significant reason for this achievement. The more impressive decline in poverty in China has been due to less initial inequality in land, reforms in land use, better health and the higher literacy. India lags behind in all these features. Disadvantaged communities, caste and gender discrimination too are impediments in mitigating poverty in India. In contrast to the achievement in the reduction in poverty, income inequality has grown in both countries. China’s inequality, as measured by the Gini Coefficient, has increased from 37 per cent in 1990 to 47.4 per cent in 2012, while India’s inequality has increased from 33 per cent in 1993 to 37 per cent in 2010. Although China’s poverty is much reduced, her income inequality is higher than in India. East and South East Asia was able to reduce poverty in tandem with economic growth. Among the reasons for this were land tenure reforms and conscious interventionist economic policies that benefitted the poor that were implemented at the same time as the economy grew. The fast track economic growth provided increasing urban and industrial employment and the government’s fiscal capacity enabled expenditures that benefitted the poor. In contrast to other regions in the world, Latin America, though the region with the most unequal income in the world has decreased inequality with rapid economic growth. The reasons behind Latin America’s decline in income inequality are, well-designed interventionist policies increased expenditure especially on higher education, stronger FDI and increase in tax revenues. Improving access of low-income families to education has been an efficient means for boosting equality of opportunity and lowering income inequality. Strengthening access to quality education is pivotal in Latin America that already has relatively high educational spending but poor outcomes. Raising low tax revenues has contributed to declining inequality as higher revenues provide more space to finance well-targeted redistributive policies. These experiences provide useful lessons and policy implications for poverty reduction and for mitigating income inequality. Most important is the need to achieve rapid economic growth that has been the driver for reducing poverty in all countries. The Chinese and Indian experience, as well as the development of East and South East Asia and of Latin America, provides ample evidence of this. While East Asia was able to achieve more equity of incomes, the Chinese and Indian experiences were ones of increasing income inequality with rapid growth. In contrast, Latin America was able to reduce huge income disparities. What these experiences imply this that economic growth while reducing poverty does not ensure equitable income distribution. The initial conditions of land ownership, education and health and social stratification have an important bearing on the impact of growth on the equitable distribution of incomes. Interventionist policies that redistribute resources or entitlements have an important impact on the extent of equity in incomes that is achieved. Improvements in literacy and education reduce inequality of incomes. Public expenditure on these is very important and therefore government revenues must be adequate to enable the fiscal space for such expenditure. The manner of raising tax revenue could also be important in reducing inequality. Progressive income tax systems, including recurrent property taxes, high taxes on luxury expenditure of the affluent, who are notorious for evading taxes, capital gains taxes and death duties would enable better income distribution by reducing incomes of the rich and enabling policy interventions that enhance the entitlements of the poor. Such policy imperatives rather than rich rhetoric on poverty are crucial.